It is Maundy Thursday and I am tired after a very difficult week. Fortunately Moises Naim publishes a complete and brief summary on how Fidel Castro sucked the brain out of Chavez making this one transform Venezuela into a Cuban colony. Long time readers of this blog knew that, of course, but it is the first time I see this so explicitly printed in major media, title included: "Cuba fed a president’s fears and took over Venezuela". The horrors of chavismo will be slowly but surely be revealed with time. The only question is what are going to say those who supported it even though so many denounced it? Since it is in the Financial Time and that subscription may apply I am reproducing it complete below, video included. I apologize to the FT who offers to share the link but does not want to repost on Web. Here in Venezuela we have no such luxuries in time of resistance and I also will share the article through Twitter BEFORE I post this entry. I hope for their understanding if they find me out. They are only 10 years late to the party on the article. Hey, was the presidential Airbus finally "fixed". Or, is the Venezuelan State still relying on Cubana de Aviación for its official international flights? Interesting coincidence, I started reading "The End of Power" yesterday. The man is a towering thinker, definitely several notches above JVR and other similar intellectuals. Sorry Daniel. That comment was supposed to be a reply to the video posted above. I read the article by Moises Naim even before I read the post. What a breath of fresh air to hear this information being aired out finally. As you said, the facts will eventually come to light and the world will say, "How come no one told us this was happening?" I suppose we can get all smug, and say "Well, we tried to tell you..."
Sen. Marco Rubio gives a forceful interview on the situation in Venezuela on CNÑ (in Spanish). Roy Roy Roy ... rookie mistake. Rubio is for traditional marriage so whatever he thinks or says in support of the opposition in Venezuela is worthless as far as this blog is concerned. I feel sorry for you. Must be hard to harbor so much cheap pettiness. The Cubans are not nearly the whole story! Yes, the regime has been subsidizing Cuba. However, what do you call it when the Regime places restraints on domestic companies that cripple domestic production, only to import from foreign profit-making producers? Also, why must the regime go to Iran and other countries to build factories and houses while domestic resources are just as able to perform? Somehow, Chavismo is more about crippling domestic producers than providing sane and competent governance (which the Cubans apparently have been unwilling or unable to provide)... what they call cutting off your nose to spite your face! Likewise, with the iron-clad control of power, the regime shouldn't really need to repress public unrest with such intensity. There are so many paradoxical anomalies in Venezuela now, that it doesn't make complete sense no matter how you try to imagine how the political events are aligned among all the players. Even the Cubans must know that further deterioration of the Venezuelan economy cannot serve their interests at all! Although the Chinese are trying to help get Sidor, Venalum, et. al. back into production, it is just another example of a tragic expropriation of a once successful vital enterprise and driving into failure. However, instead of going "backwards" to what had worked just fine, the regime is going into another experiment that has nothing to do with the Bolivarian Revolution! Handing over government institutions to the Cubans, and handing over the domestic industrial complex to China? Is that the mission of Chavismo? I lost respect for the man after I read an article from him a few years ago comparing Al Qaeda with the Tea Party, besides other nonsense like blaming the latter for that hoax called Global Warming. This is a very revealing article. How many Venezuelans know what Naim describes and how many care? 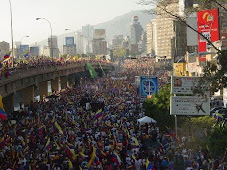 It seems that it matters not who is the governing party is in Venezuela. The Cuban "takeover" is so advanced it will take forever to reverse the situation by any Opposition.